Last month was Ronald Reagan’s 104th birthday. I wish he were alive to celebrate, probably more than most conservatives I know. It would be interesting to see Reagan’s take on today’s political environment. Most likely his opinion would be tossed by the wayside by the same individuals that currently profess his adoration. When Bob Dole, a former GOP presidential candidate, was asked if this political climate is conducive to electing someone like Reagan he admitted, “Reagan couldn’t have made it. Certainly, Nixon couldn’t have made it, because he had ideas. We might’ve made it, but I doubt it.” Reagan’s historical context explained by many on the right is more fiction than fact. In today’s political landscape Reagan would be viewed as an un-trusted moderate by the right, or perhaps wear the “RINO” scarlet letter. Based on comments and actions as a policy maker, it would not be a reach to assume Reagan would support LGBT rights, climate change, immigration reform, and common sense gun legislation. For those who appreciated Ronald Reagan’s compromising spirit, moderate policies, and bias for action, President Obama should be a breath of fresh air. The only abortion law signed by President Obama removed federal dollars for funding. Reagan, on the other hand, signed the Therapeutic Abortion Act which provided access to abortion for millions of women. Instead of passing a one trillion dollar stimulus bill as promised in his campaign, Obama scaled spending back to $500 billion and signed $300 billion of incremental tax cuts; one of the largest tax cuts in our nation’s history. After campaigning on single-payer care during his 2008 run, Obama signed a scaled back healthcare law that reinforced insurance and pharma markets and pushed people to buy private care. This same concept originated from the ultra-conservative Heritage think-tank (and was the foundation for Mitt’s “Romneycare”). Reagan, on the other hand, signed a law opening up emergency rooms to everyone at the expense of the government (taxpayers). After speaking publicly concerning the need to roll back the ill-fated Bush tax cuts, President Obama renewed many of the more controversial tax breaks. Reagan, on the other hand, passed two of the largest tax hikes in our nation’s history to offset rampant discretionary spending. President Obama is managing the discretionary side of the budget (the part controlled by the Executive Branch) responsibly. In fact no president in the last century has seen absolute spending reduced 20% ($1.4 Trillion to $1.1 Trillion) after their first six years in office. Reagan, on the other hand, grew discretionary spending by 38%. President Obama has seen the unemployment rate drop from its height of 10% down to 5.6% after his second midterm. Reagan saw the unemployment rate drop from 10.8% to 6.6% after his second midterm. The Fed’s role driving economic growth under Obama through quantitative easing is significant. The Fed’s role slashing interest rates under Reagan’s economic tenure was equally significant. President Obama reduced the annual deficit 65% with increasing tax receipts and a growing economy. Reagan, on the other hand, doubled the annual deficit with similar increasing tax receipts and a growing economy. The National Debt under Obama has doubled due to mandatory spending not controlled by annual appropriations. The National Debt tripled under Reagan driven by discretionary spending which is controlled by annual appropriations. President Obama has not signed or sponsored a single law in regards to gun legislation. Ronald Reagan, one of NRA’s chosen sons, actively campaigned for passage of the Brady Bill including writing a national op-ed for the New York Times. President Obama’s biggest foreign policy disaster which tarnished our global reputation was arguably the NSA wiretaps. However, this pales in comparison to Reagan’s Iran Contra Affair. President Obama has been called the “Deporter-In-Chief” given his tough stance on enforcing immigration laws. Although he recently signed an executive action providing protection for DREAMERs and undocumented immigrants with conditions, this is trivial compared with Reagan’s granting millions of undocumented immigrants full amnesty with no conditions. President Reagan never once backed down from his amnesty decision. President Obama’s approval rating is hovering around 48%, which is the exact same approval rating Reagan held at this same time in his presidency. President Reagan’s party lost eight seats in the Senate during his sixth year in office flipping control to the Democrats. President Obama’s party lost nine seats during his sixth year flipping control to Republicans. President Obama has made using force as a last resort the backbone of his presidency. In the wake of melodramatic Republican leadership calling for attacks on Syria, ISIS, Egypt, Russia, and North Korea throughout his time in office, President Obama has instead leveraged the international community for support. Not only have these actions kept American soldiers out of harm’s way, they should be the foundation of conservative policy. Reagan’s economic backbone was built upon trickle-down economics; the idea that when the wealthy have more money they create more jobs. 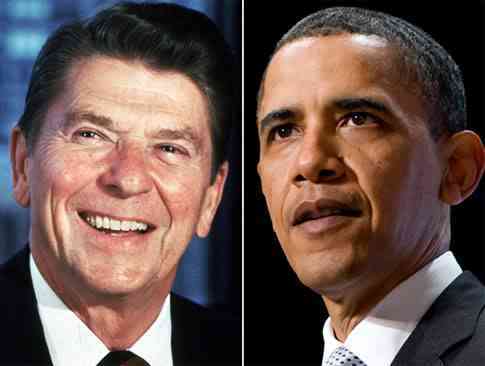 President Obama, not Reagan, has presided over the largest economic boom for the upper class in the last century. Corporate profits are at an all-time record, the stock market has doubled in the last five years, and baby-boomers are retiring in droves. If you support trickle-down theory, you should adore President Obama. The GOP loves Ronald Reagan…except for his position on guns, immigration, abortion, taxes, and compromising with the left. Critics of President Obama often cite the national debt or the labor participation rate as evidence of his failed policies. Both of these metrics are being driven by record numbers of baby-boomers retiring due to healthy pensions and robust 401k accounts. With over 40 million senior citizens not working, the National Debt is being hammered through rising Social Security and Medicare expenditures. The labor participation rate continues to fall as these senior citizens, the same ones who drove Reagan’s economy, are leaving the work force. It was up to Reagan’s economy to find jobs for this demographic and up to Obama’s economy to provide means for their retirement. To be fair there are many policy differences between President Reagan and President Obama. Specifically their approach with unions, military spending, and the role of government separate the two administrations. However, both men are fairly pragmatic when it comes to economic policy, liberal with social policy, and made important compromises with the opposing party to pass impactful legislation. President Obama will always be labeled by those who oppose him politically, but if the final two years of his presidency are continuations of the last two, his place in history will be synonymous with Reagan’s. ← Previous Previous post: Did President Obama Double Our National Debt?